In this intricate novel of psychological suspense, a chilling discovery near the high school ignites a witch-hunt in a Southeast Texas refinery town, unearthing communal and family secrets that threaten the lives of the town’s girls. In Port Sabine, the air is thick with oil, superstition reigns, and dreams hang on making a winning play. All eyes are on Mercy Louis, the star of the championship girls’ basketball team. Mercy seems destined for greatness, but the road out of town is riddled with obstacles. There is her grandmother, Evelia, a strict evangelical who has visions of an imminent Rapture and sees herself as the keeper of Mercy’s virtue. There are the cryptic letters from Charmaine, the mother who abandoned Mercy at birth. And then there’s Travis, the boy who shakes the foundation of her faith. At the periphery of Mercy’s world floats team manager Illa Stark, a lonely wallflower whose days are spent caring for a depressed mother crippled in a refinery accident. Like the rest of the town, Illa is spellbound by Mercy’s beauty and talent, but a note discovered in Mercy’s gym locker reveals that her life may not be as perfect as it appears. The last day of school brings the disturbing discovery, and as summer unfolds and the police investigate, every girl becomes a suspect. When Mercy collapses on the opening night of the season, Evelia prophesies that she is only the first to fall, and soon, other girls are afflicted by the mysterious condition, sending the town into a tailspin, and bringing Illa and Mercy together in an unexpected way. 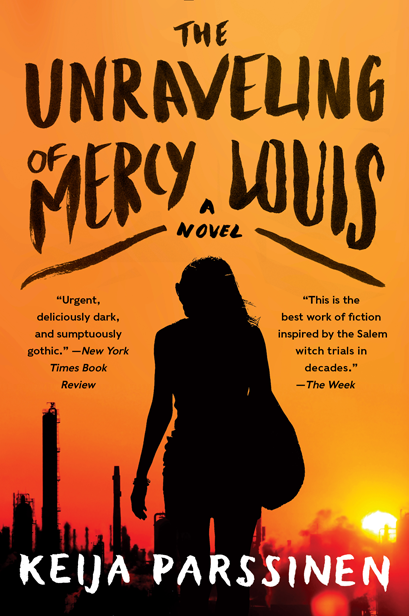 Evocative and unsettling, The Unraveling of Mercy Louis charts the downfall of one town’s golden girl while exploring the brutality and anxieties of girlhood in America.